Para sa iba pang mga tao na pinangalanang John Carpenter, tingnan ang John Carpenter (paglilinaw). 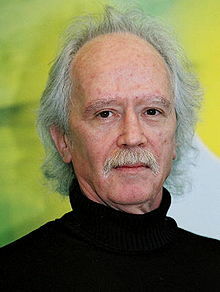 Si John Howard Carpenter (ipinanganak Enero 16, 1948) ay isang Amerikanong direktor, manunulat at musikero. Kahit na nagtrabaho si Carpenter sa iba't ibang genre ng pelikula, siya ay madalas na nauugnay sa mga pelikulang katatakutan, aksyon at sa siyensyang-pangkaisipan noong 1970s at 1980s. Si Carpenter ay ipinanganak noong Enero 16, 1948 sa Carthage, New York, ang anak nina Milton Jean (née Carter) at Howard Ralph Carpenter, isang propesor sa musika. Siya at ang kanyang pamilya ay lumipat sa Bowling Green, Kentucky noong 1953. ↑ Jason Zinoman (June 24, 2011). "A Lord of Fright Reclaims His Dark Domain". The New York Times. https://www.nytimes.com/2011/06/26/movies/john-carpenter-directs-the-ward.html?pagewanted=all. ↑ "John Carpenter Biography (1948–)". Film Reference. http://www.filmreference.com/film/70/John-Carpenter.html. ↑ Kleber, John E., ed (1992). "Carpenter, John Howard". The Kentucky Encyclopedia. Associate editors: Thomas D. Clark, Lowell H. Harrison, and James C. Klotter. Lexington, Kentucky: The University Press of Kentucky. ISBN 0-8131-1772-0. Conrich, Ian; Woods, David eds (2004). The Cinema of John Carpenter: The Technique of Terror (Directors' Cuts). Wallflower Press. ISBN 1-904764-14-2. Hanson, Peter; Herman, Paul Robert eds. (2010). Tales from the Script (Paperback ed.). New York, NY: HarperCollins Inc. ISBN 978-0-06-185592-4. Muir, John Kenneth. The Films of John Carpenter, McFarland & Company, Inc. (2005). ISBN 0-7864-2269-6.